An unpublished, posthumous story of friendship, courage, and individuality, and the importance of finding who you are by the bestselling author of Corduroy! 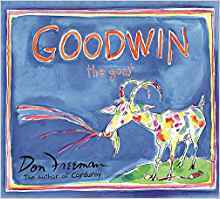 Goodwin the Goat by famed author of Corduroy, Don Freeman (August 11, 1908 – January 1, 1978), is a never-before-published story of a mischievous young goat named Goodwin. One day, after growing tired of his daily wheat and oats, he goes out in search for new types of delicious food and stumbles upon an artist painting by the river and notices her scrumptious colorful paint tubes. After the artist leaves, Goodwin tries to eat the paint tubes and covers himself in paint. After running away from the angry artist, Goodwin awakes the next morning and passersby do not notice him, vibrant and multicolored, standing on top of his hut. Goodwin immediately achieves immediate fame, as tourists from far and wide come to visit and photograph “Goodwin the Miraculous Goat.” Angry that Goodwin destroyed her painting, the artist confronts Farmer Mac Duff and asks him to pay her for her destroyed materials and art. Farmer Mac Duff, who’s struggling financially, partners with the artist and creates a business out of the attraction in order to pay her back for her materials and destroyed art but can Goodwin stay out of trouble? Featuring full color illustrations, Goodwin the Goat is sure to enchant young readers with its playful narrative and fun colors. Grab your copy and experience a true story of friendship, courage, individuality, and the importance finding who you really are. 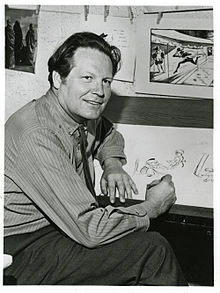 About the Author/Illustrator: Don Freeman (August 11, 1908 – January 1, 1978) has painted and drawn his way into the hearts of youngsters since publishing his first book for children in 1951. Co-authored with his wife Lydia for their son Roy, the book, Chuggy and the Blue Caboose, was the first of many colorful children’s books written and illustrated by Freeman. Several of his books have since been translated into foreign languages and are still in print today. Freeman did not start out to be a children’s author and illustrator, although by the age of seven he knew he wanted, above all else, to be an artist more than anything. Working with crayolas and whatever drawing paper he could get his hands on, the young Freeman began sketching a perceptive view of the world around him. He is best known for the Children’s book Corduroy.